Colington Harbour is a private gated subdivision situated in the heart of the Outer Banks. 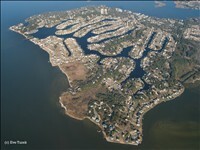 With over 2,400 lots, the Harbour is also the largest, and serves as home to a thriving boating community featuring miles of canals and scenic sound front homes along the beautiful Albemarle Sound. Amenities within our neighborhood include a huge sound side park with sandy beaches, a playground, and sheltered picnic areas, a basketball court, as well as a boat launch and boat slips for rent. For a nominal fee, residents may also join the Yacht and Racket Club, which allows use of the two outdoor swimming pools, tennis courts, and community clubhouse.